I was super excited to receive a whole summer running outfit from Brooks - from top to bottom: the Versatile EZ Racerback Tank, Epiphany bra top, Glycerine Shorts and Trailblade shoes. 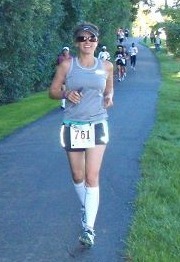 Running the Oakbrook half marathon in my Versatile EZ Racerback Tank. 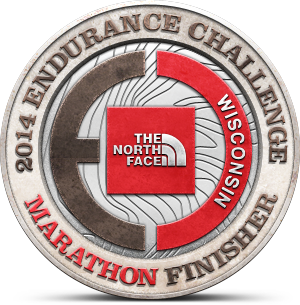 The Versatile EZ Tank and the Glycerine Shorts were perfect for running in the heat and humidity of the Midwest summer. The Versatile EZ Racerback Tank's lightweight, moisture wicking fabric is very soft and comfortable with just the right amount of stretch. The subtle blossom print detail on the back and contrasting princess seams add a nice design touch. The Glycerine Short is also very comfortable and lightweight. The flattering semi-fitted, low-riders have a 3 1/2" inseam which allow for unrestricted movement. The low rise, a wide waist band and soft inner liner prevent riding up and chafing. The wicking material is quick drying and doesn't show sweat. The Epiphany Bra Top is a great sports bra. It has mesh on the sides and back for greater breathability. With a stylish racerback design and encapsulation/compression cups, it is very comfortable for light to moderate activity, but did not provide enough support for me for running. I enjoy wearing it for lower impact activities such as hiking, biking and playing with the kids. Plus it's comfortable enough to wear all day! 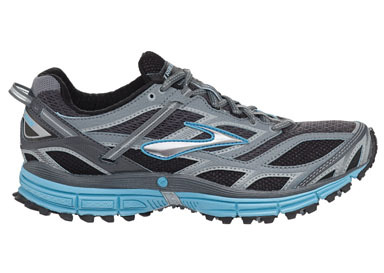 The Trailblade is the perfect shoe to run to and through trails. It is rough and rugged, providing the support for dirt, roots, gravel, etc. yet light and easy on the road. 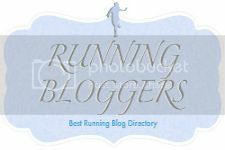 Although I would like to run more trails, my fear of running alone through the woods and getting lost keeps me mostly on the roads (unless I go with my hubby or on shorter trails where I'm comfortable going solo). I brought my Trailblades on our trip to Lithuania this summer with the intention of running. Instead I ended up doing a lot of walking in them - they're super comfortable as walking shoes! Right at the peak of heat and humidity, the timing of the arrival of my Brooks summer gear couldn't have been better! Brooks makes quality, comfortable and stylish running gear with their True Blue Guarantee. If you are not completely satisfied, return them within 30 days, no questions asked. Not just functional, but comfortable and they look great on you as well! Thanks for the Brooks review. I have been looking at their website for shoes. I absolutely love the True Blue Guarantee. 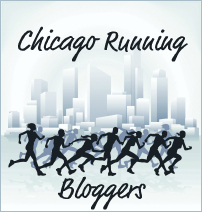 Have look at other running shoe site and they dont have that. I cant wait to see the new Pure Connect running shoe in October. You looked absolutely adorable!! I so wish we could have had the opportunity to meet...hopefully another time. I looked at your brightroom pictures (save yourself some agony and don't look at mine), and you look so happy. I hope you had a great first half experience!